As we get ready to attend C-Sigma VI in London, I am reminded that we are often asked how satellite AIS fits into ORBCOMM’s portfolio of asset tracking solutions. That is a very good question! For the maritime market and aside from collision avoidance, satellite AIS allows a broad range of stakeholders insight into the whereabouts and status of vessels as they move from one port or terminal to the next. One example of this is Sea-web, offered by ORBCOMM’s partner, IHS Maritime. 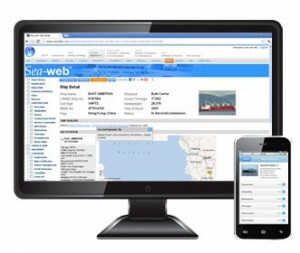 In addition to being a comprehensive maritime database that includes information on ship registry, casualties, port state control and vessel ownership, Sea-Web also provides live ship positions and vessel movement history based on IHS Maritime’s extensive terrestrial AIS network and ORBCOMM’s satellite AIS data. Satellite AIS is also an important secondary source of location information that complements data from other tracking systems like Long Range Identification & Tracking (LRIT), Vessel Monitoring Systems (VMS) used in fisheries, and satellite imagery. The AIS data helps to verify the data received from these other systems, especially in the case where there may be unlawful tampering. This is exactly what our colleague George Best had recently discussed during his satellite AIS session at QMARSEC. The service can also help to more accurately predict when ships will arrive at port which can then be used for port agent arrival/departure information, notice of arrival reports, and customs declarations, just to name a few. We shouldn’t forget that it is not just the location of the vessel, but what is on board the vessel, that is equally important to many. Our latest acquisition of WAM Technologies, which provides refrigerated container and genset tracking and monitoring services, will enable shippers to combine information about their containers with satellite AIS location information for more complete in-transit visibility of their cargo. So as you can see Satellite AIS is not just about collision avoidance. It is about providing another source of information for complete visibility of the location and status of assets which complements ORBCOMM’s other offerings. Want to learn more? See ORBCOMM’s Greg Flessate, Senior VP of Government & AIS Services, at C-Sigma VI in London, UK from December 7-8, to find out how satellite AIS is being used in a variety of markets as well as how the upcoming launch of OG2 satellites is going to further enhance ORBCOMM’s satellite AIS offering.